A biodiversity analysis using macrofossils of land plants as well as spores and pollen shows that plants fared much better than animals during the most severe mass extinction. Biotic and abiotic changes around the Permian–Triassic transition have been intensely debated in various fields of earth sciences during the last decades, since it was the time of the most severe mass extinction – for marine invertebrates at least. The actual impact of the environmental upheavals on land biota was less clear. For land plants, different studies came to different conclusions: Either, that plants did not experience a mass extinction (but maybe a minor extinction event), or that they were affected just as much as the animals. Terrestrial vegetation evidently underwent important changes, but that alone does not imply a mass extinction. Previous biodiversity analyses of plants from this time interval relied only on macrofossils (leaves, wood, fructifications, etc. ; Fig. 1), but there are not many well-preserved fossil floras from the Lower Triassic. Data on plant microfossils (spores and pollen; Fig. 2) are much more abundant, but so far have not been used for a global biodiversity analysis. In our paper (Nowak et al., 2019), we used occurrence data of both types of fossils. Fig. 1. Quadrocladus sp. (ultimate shoot), a typical late Permian conifer from the middle Wuchiapingian Gröden/Val Gardena Sandstone in the Bletterbach gorge (Dolomites, Italy). Fig. 2. 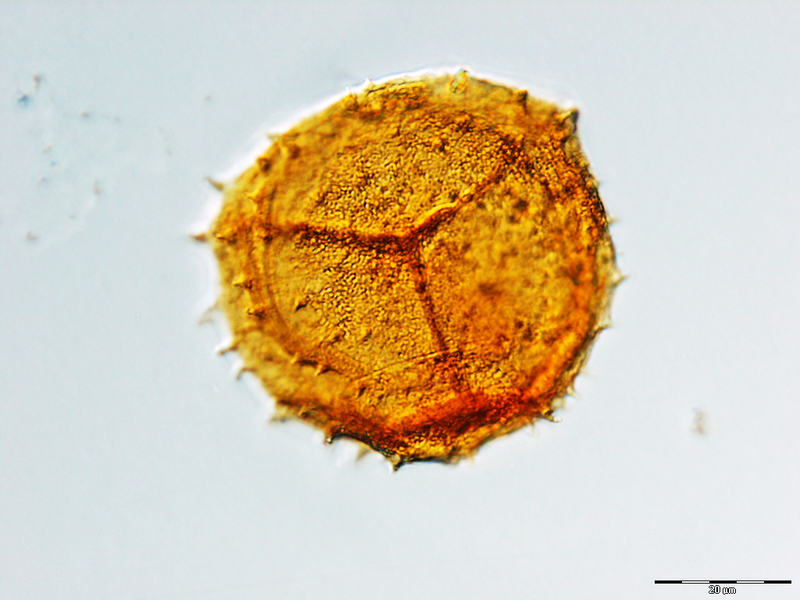 Kraeuselisporites apiculatus, a spore from the Permian–Triassic boundary interval of the Finnmark platform (Norway). Photo: Peter Hochuli. 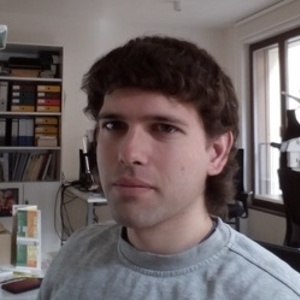 As a palaeobotanist working on Permian–Triassic floras, my co-author Evelyn Kustatscher was familiar with the issue and she knew that I had performed a biodiversity analysis during my PhD (on Cambrian acritarchs). Thus the idea was born to perform a similar analysis on both macro- and microfossils of land plants. It was clear that the collection and cleaning of data would be a , but we saw the untapped potential in this approach. We got Elke Schneebeli-Hermann onboard, who was working on palynomorphs from this time and brought in data that showed a rather complex picture of the mass extinction interval. It took us about two years to aggregate the data we needed. Evelyn’s personal library, which had grown to a respectable size thanks to her own collecting effort and sizable gifts from senior researchers, yielded quite a few valuable data sources. Thanks to the development towards open access, we could also get hold of many references and corresponding supplementary raw data online. In addition, several colleagues sent copies of relevant works. 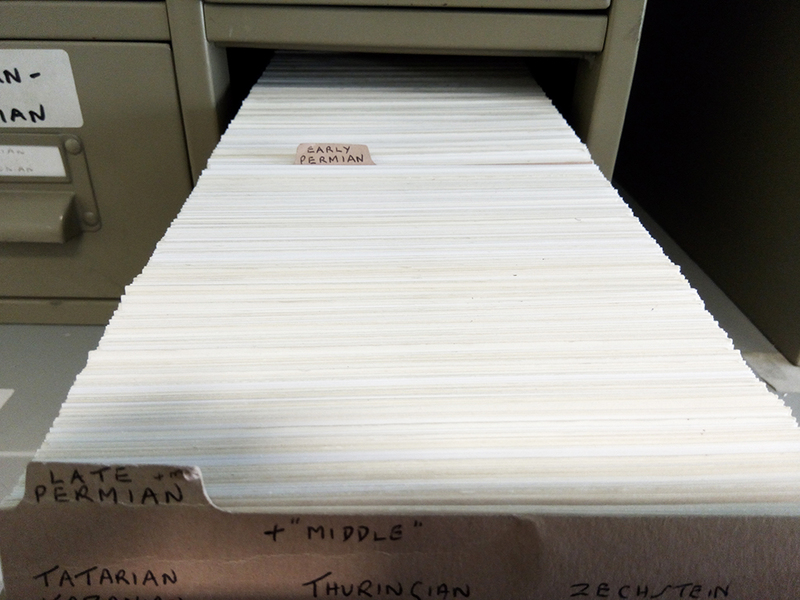 Evelyn’s own studies of several palaeobotanical collections at institutions across Europe were another valuable contribution to the present study. Meanwhile, I visited the Natural History Museum (NHM) in London for two weeks with a SYNTHESYS Access grant. The NHM houses the John Williams Index of Palaeopalynology (JWIP; Fig. 3), which is considered to be the most extensive collection of palaeopalynological references in the world, with over 23.000 indexed publications. Most of these publications are also available in John Williams’ library, which is likewise housed by the NHM. The JWIP with its attached library constitutes a highly useful resource for a study like ours, as I had already experienced during my PhD, when I had visited it for the first time. This time, I found a huge amount of potentially relevant references – more than 1.200 for the studied interval. Inevitably, our analysis is not based on all available data; new data is published continuously, and many publications are difficult to obtain. Eventually, we had to stop collecting and commence with the actual analysis. A lot of the data that we had gathered could not be used in the end for various reasons, but mostly because stratigraphic information could not be resolved to the international stages that we used as bins. Nevertheless, even after filtering out the unusable cases, we still had over 8.000 records of land plant macrofossils and over 34.000 records of spores and pollen from the late Permian to the Middle Triassic for our analysis. Fig. 3. The John Williams Index of Palaeopalynology at the Natural History Museum in London. 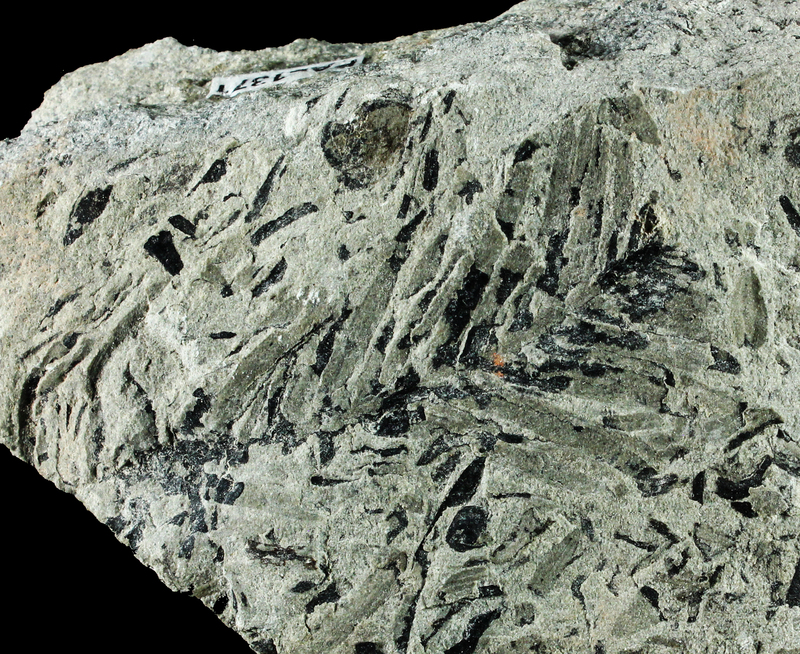 Our results demonstrate that there is no evidence of a mass extinction in land plants at the Permian–Triassic boundary, but there is evidence that the fossil record of plant macrofossils – especially gymnosperm macrofossils – from the Lower Triassic is insufficient, which may give the impression of a mass extinction. In general, animal mass extinctions throughout the history of life had no major impact on land plants. Our results are therefore consistent with a generally high resilience of land plants against extinction. However, it should be noted that with a few likely exceptions the plants of the Permian were not dependent on interactions with animals, unlike many plants (especially angiosperms) today. Therefore, future faunal extinctions may have a bigger impact on certain plant groups.